DJI are marketing the Spark as a ‘drone for everyone’. Packed with all the intelligent features of its predecessors while bringing a few new additions to the table, there’s a lot to be excited about with this new mini quadcopter. However, they only recently released the precursor to this diminutive drone, the Mavic Pro which received rave reviews from users and tech journalists alike. Will the Spark be able to live up to both the hype surrounding it and the level of quality demonstrated by its larger foldable sibling? Heliguy’s Insider takes a look at both aircraft to give you an idea of which is best suited to your needs. ios: iPhone 5s, iPhone 6, iPhone 6 Plus, iPhone 6s, iPhone 6s Plus, iPhone 7, iPhone 7 Plus, iPod touch 6, iPad Pro, iPad Air, iPad Air Wi-Fi + Cellular, iPad mini 2, iPad mini 2 Wi-Fi + Cellular, iPad Air 2, iPad Air 2 Wi-Fi + Cellular, iPad mini 3, iPad mini 3 Wi-Fi + Cellular, iPad mini 4, and iPad mini 4 Wi-Fi + Cellular. This app is optimised for iPhone 5s, iPhone 6, iPhone 6 Plus, iPhone 6s, iPhone 6s Plus, iPhone 7 and iPhone 7 Plus. Now that we’ve looked through the specifications of these two small but mighty quadcopters, this article will dig a bit further into what makes them so intuitive and enjoyable to fly. First things first, let’s start with what you can expect from both products straight out of the box. 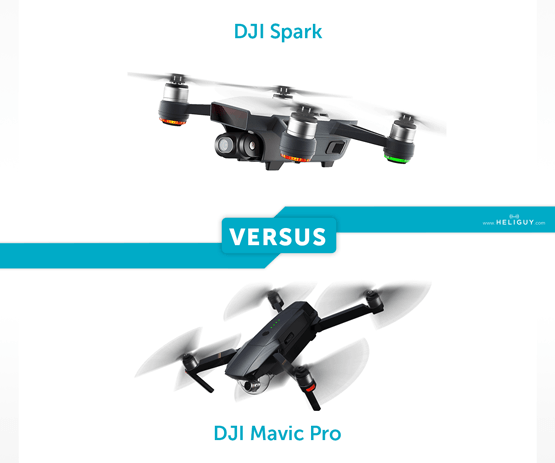 To give you the most comprehensive idea of what both these quadcopters offer, we’ve included both the standard versions (Spark / Mavic) and the Fly More Combo versions (Spark / Mavic). Featuring an aerodynamic, lightweight design, the DJI Spark‘s sleek design is optimised for minimal wind resistance. The front-mounted gimbal and camera are flush with the aircraft which increases the overall stability of the system. The fact that it doesn’t fold away like the Mavic Pro isn’t much of an issue at all considering that, astoundingly, it is still smaller and more portable than the Mavic’s folded state. DJI has also given people a choice of colours to further personalise their aircraft. As well as the default Alpine White there is also the option of Sky Blue, Meadow Green, Lava Red, and Sunrise Yellow (these coloured shells are part of the aircraft and aren’t interchangeable so choose wisely!). There will be plenty of demand for this customisation and it shows that DJI still knows how to give consumers a little bit extra. The DJI Mavic Pro‘s now iconic design incorporates innovative folding functionality. As is to be expected, the Mavic benefits from the solid construction & high-quality materials synonymous with the Shenzhen brand. There’s also an intuitive and ergonomically enhanced controller with dual display ensuring fewer distractions on your device’s camera view. All sharp lines and metallic grey, you can tell the Mavic is superbly aerodynamic before you’re even seen it in the air. When it’s folded away, you’ll be left wondering how DJI have managed to pack in all the functionality. Then there’s the camera and the optional clear housing which offers protection for the lens and 3-axis gimbal, rounding off the attractive aesthetics. For such a small drone, the DJI Spark certainly has a lot of power behind it. 50kph of propulsion means you can expect a steady flight at speeds of up to 31mph in Sport Mode. This setting switches the gimbal mode to FPV by default, so the camera intuitively moves with you as you fly. For an upgraded FPV experience, the Spark is fully compatible with the DJI Goggles. DJI has also developed an advanced flight control system to make flying more fun and intuitive. 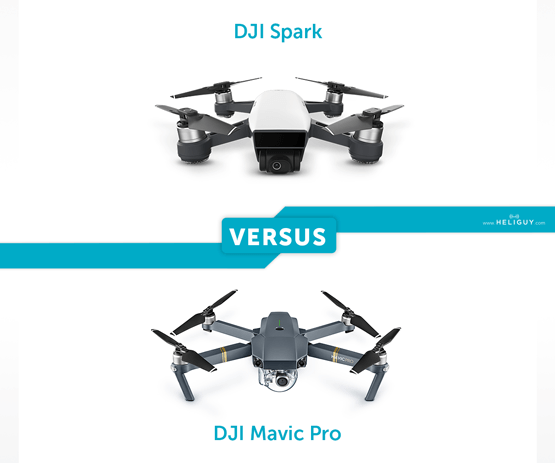 Controlled via a custom built RC device, your mobile device or even your hands, the DJI Spark offers a great deal of variety in use. An innovative HD Wi-Fi system allows 720p video transmission from up to 2km away. 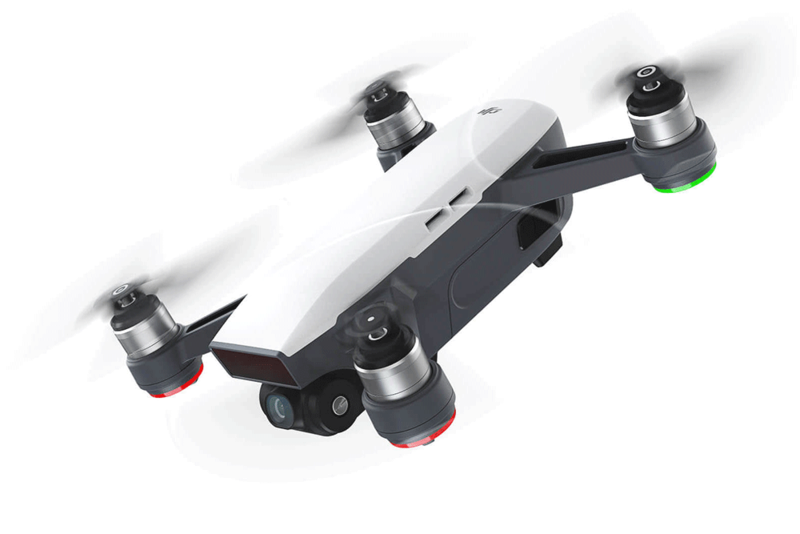 The addition of ‘Deep Learning Gesture Recognition’ lets you capture ‘Dronies’ using simple hand motions and PalmControl mode controls the DJI Spark’s aerial movement by hand. DJI’s new FaceAware system means that the Spark can lift off from your hand by utilising face recognition alone. Once it has locked on to you, it can take off and hover within seconds of powering on. 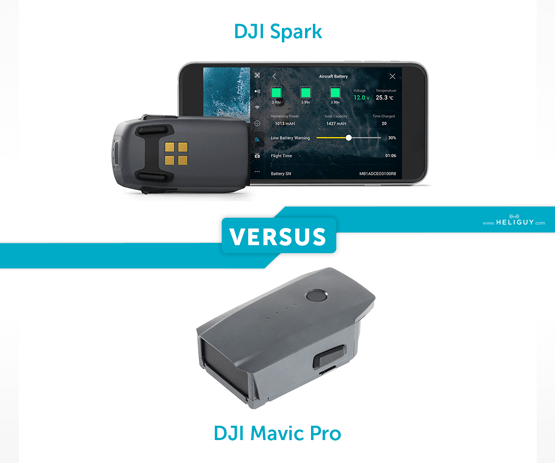 The DJI Spark features TapFly and ActiveTrack which have now become DJI mainstays. The mini quadcopter also makes use of a powerful FlightAutonomy system which includes the front-mounted camera, its vision positioning system, a 3D sensing system, dual-band GPS, an inertial measurement unit and 24 computing cores. This allows Spark to hover accurately with VPS assistance at up to 98ft, sense front-facing obstacles from up to 16ft away and also land safely every time. It’s also compatible with DJI’s SDK (Software Development Kit) allowing you to customise the Spark to fit your needs and makes use of their GEO system which lets you know where drone flights may raise security concerns, such as near airports or stadiums. 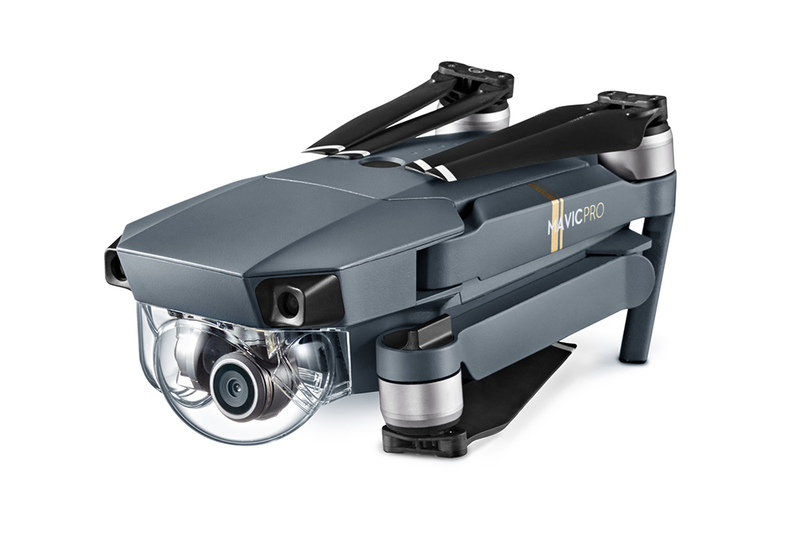 The Mavic Pro utilises and builds upon its predecessors (the Phantom quadcopter series). This means that DJI’s ActiveTrack and TapFly, as well as new features like TerrainFollow – which enables the Mavic to intelligently follow you up inclines without crashing – are available in a smaller, more portable package. The fact that the arms fold flush into the drone’s body thanks to some brilliant engineering from DJI ensures that it’s even smaller and easier to transport. The Mavic Pro also comes with a Sports Mode allowing it to reach speeds of up to 40mph in optimal conditions. This speedy feature has been advertised alongside the DJI Goggles which allow for a VR FPV drone flying experience including the ability to use ‘head tracking’ to control the camera. As for ease of use, the Mavic has been hailed as one of the simplest drones on the market to get to grips with. While there is plenty of depth available for seasoned flyers looking for an easily portable aerial camera, it’s also ideal for those just starting out with its advanced visual positioning and obstacle avoidance (up to a range of 15m) making sure that your flights are issue free. Pinpoint locational sensors also ensure that the aircraft remains impressively steady even indoors out of satellite range. 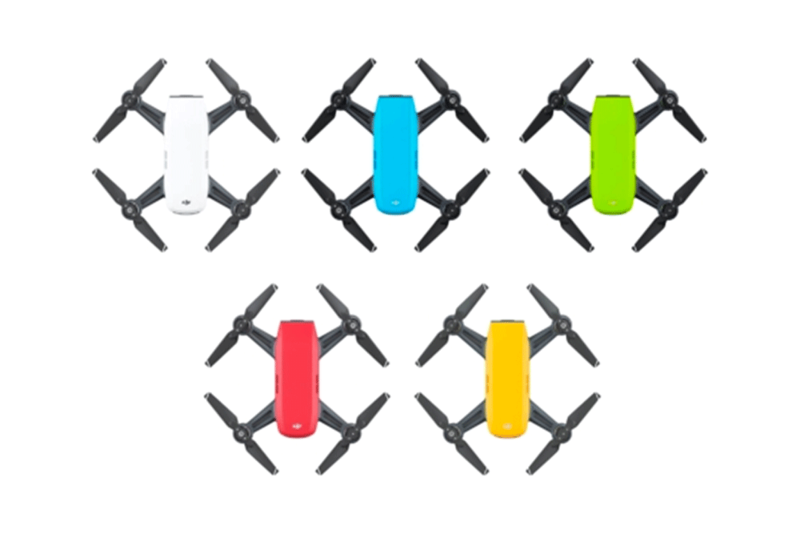 The DJI Spark uses a high-energy density LiPo battery (1480mAh) and features 12 intelligent protection features which ensure greater safety during flights. Additionally, the mini drone’s battery can estimate remaining flight times, which offers a heads up on when to land in real-time. Even with all of its smart features, you can get up to 16 minutes of flight with a fully-charged battery, allowing you to capture more footage. 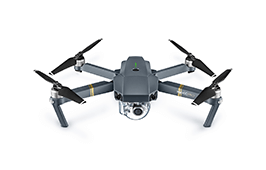 The Mavic Pro is powered by a purpose-built Intelligent Flight Battery (3830mAh) featuring built-in sensors and LEDs that display the status and remaining power. Despite the smaller power source, the Mavic is able to remain airborne for up to 27 minutes which rivals the DJI Phantom 4 and offers you plenty of time to capture all the imagery you need. 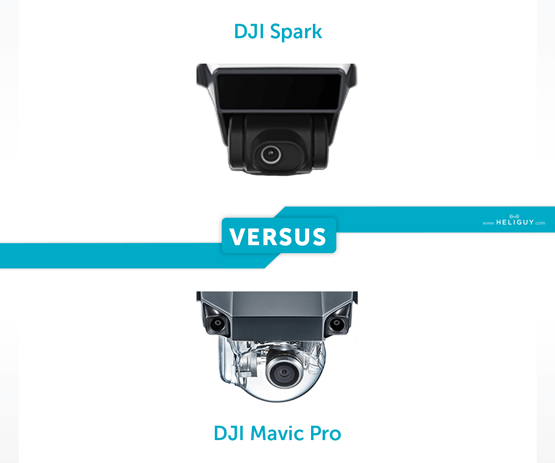 DJI has designed the Spark’s camera to ensure that all imagery us consistently sharp with little-to-none colour aberration and distortion. Featuring a f/2.6 wide-angle lens with a 25mm equivalent focal length, the camera’s five elements are arranged into a single group that fit into a compressed frame. 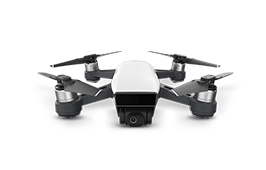 Small and compact like the drone itself, the camera features a 1/2.3″ CMOS sensor which allows for stabilised video at 1080p and stills at 12MP. The use of larger pixels means that the DJI Spark is sensitive to light and can record colours with precision. Keeping the camera in place is the 2-axis mechanical gimbal coupled with UltraSmooth technology which dramatically reduces shake and rolling shutter effects. The Spark has adopted all of the previous DJI shooting modes while adding two new features: Pano and ShallowFocus. Pano: This mode shoots both horizontal and vertical panoramas by automatically adjusting its gimbal and heading. ShallowFocus: This feature uses the DJI Spark‘s 3D vision technology to create photos with a shallow depth of field. Featuring DJI’s smallest ever stabilised 3-axis integrated gimbal and camera, the DJI Mavic Pro is capable of shooting in 4K and 12MP with Adobe DNG RAW functionality. There’s also a new ‘Gesture Mode’ which allow you to command the Mavic to take pictures with a wave of your hand and a ‘Tripod Mode’ which ensures that every manoeuvre becomes precise and slow for optimum shot quality. One thing to note is that you can expect a narrower FOV than you’ll get from the Phantom 4 but far from being a drawback, this ensures a higher level of image quality. There are additional sensors which are refined versions of the P4’s obstacle avoidance solution and the visual positioning introduced with the Inspire 1 range. Utilising these sensors, the Mavic has one of the most stable stationary hovers you’ll see from any drone on the market. If you want to learn more about the DJI Spark, the Mavic Pro or any of their other products, don’t hesitate to get in touch with us via the details listed below. 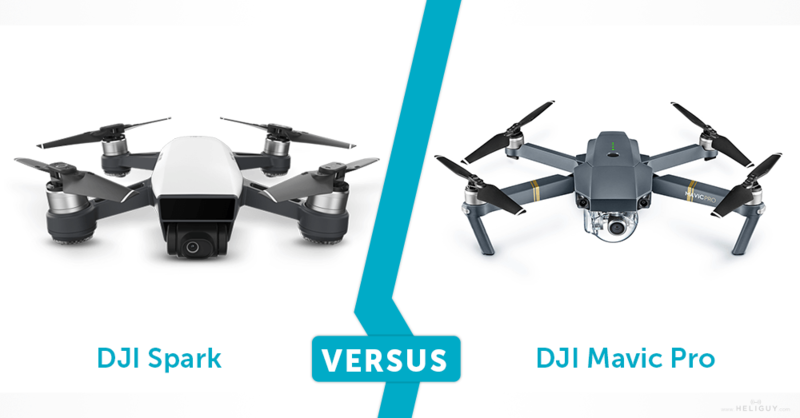 Keep checking back to Heliguy’s Insider Blog to learn more about DJI’s latest products, read our in-depth VERSUS series and, of course, stay up to date on the goings on in the drone industry.